As the cross is to Christians, so is Om to Hindus. It is made up of three Sanskrit letters, aa, au and ma which, when combined, make the sound Aum or Om. This most important symbol in Hinduism, is chanted in every prayer and invocation to deities. As the symbol of piety, Om is often found at the head of letters, pendants, and displayed in Hindu temples and family shrines. The syllable Om occurs even in English words and carries a similar meaning; some examples are 'omniscience', ‘omnipotent’, and 'omnipresent'. Thus, Om is also used to signify authority as well as divinity. Its similarity with the Latin 'M' as also to the Greek letter 'Omega' is discernible; this implies a common origin of these latter languages from Sanskrit as well as the importance assigned to the word. Even the word 'Amen' used by Christians and of 'Ameen' used by Muslims to conclude a prayer seems to be akin to Om. Om in Daily Life: Although Om symbolizes the most profound concepts in Hindu belief, it is in use daily. The Hindus begin their day or any work or journey by uttering Om. This sacred symbol is often found at the head of letters, at the beginning of examination papers and so on. 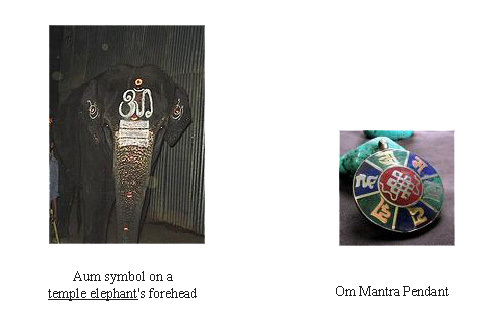 Many Hindus, as an expression of spiritual perfection, wear the sign of Om as a pendant. This symbol is enshrined in every Hindu premise temple or in some form or another in family shrines. The Eternal Syllable: According to the Mandukya Upanishad, "Om is the one eternal syllable of which all that exists is but the development. The past, the present and the future are all included in this one sound, and all that exists beyond the three forms of time is also implied in it". The Music of Om: Om is not a word but rather an intonation, which, like music, transcends the barriers of age, race, and culture. It is made up of three Sanskrit letters, aa, au and ma which, when combined together, make the sound Aum or Om, as mentioned above. It is believed to be the basic sound of the world and to contain all other sounds. It is a mantra or prayer in itself. If repeated with the correct intonation, it can resonate throughout the body so that the sound penetrates to the centre of one's being, the atman or soul. There is harmony, peace and bliss in this simple but deeply philosophical sound. " By vibrating the sacred syllable Om, the supreme combination of letters, if one thinks of the Ultimate Personality of Godhead and quits his body, he will certainly reach the highest state of "stateless" eternity", states the Bhagavad Gita. 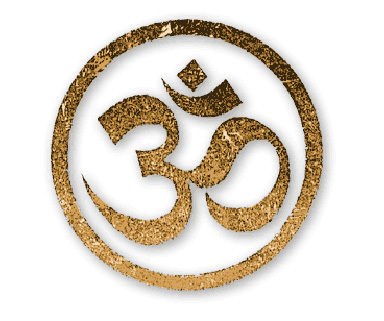 The Power of Om: During meditation, when we chant Om, we create within ourselves a vibration that attunes synchrony with the cosmic vibration and we start thinking of universatality. The momentary silence between each chant becomes palpable. Mind moves between the opposites of sound and silence until, at last, the sound ceases. In the silence, the single thought, Om, is quenched and there is no thought. This is the state of trance, where the mind and the intellect are transcended as the individual self merges with the Infinite Self in the pious moment of realization. It is a moment when the petty worldly affairs are lost in the desire for the universal. Such is the immeasurable power of Om. Om is a mystical or sacred syllable in the Hindu, Jain, and Buddhist religions. It is placed at the beginning of most Hindu texts as a sacred exclamation to be uttered at the beginning and end of a reading of the Vedas or prior to any prayer or mantra and also is said in the beginning of any religious ritual or puja. The syllable Aum is first described as all-encompassing mystical entity in the Upanishads. Today, in all Hindu art and all over India and Nepal, 'Aum' can be seen virtually everywhere, a common sign for Hinduism and its philosophy and theology. Upanishads and Sutra literature: The syllable is mentioned in all the Upanishads, set forth as the object of profound religious meditation, the highest spiritual efficacy being attributed not only to the whole word but also to the three sounds a (a-kāra), u (u-kāra), m (ma-kāra), of which it is composed. A-kara means form or shape like earth, trees, or any other object. U-kara means formless or shapeless like water, air or fire. Ma-karameans neither shape nor shapeless (but still exists) like the dark matter in the Universe. When we combine all three syllables we get AUM which is a combination of A-kara, U-kara, and Ma-kara. The Bhagavad Gita (8.13) recites: Uttering the monosyllable Aum, the eternal world of Brahman, One who departs leaving the body (at death), he attains the superior goal. The Bhagavad Gita (9.17) recites: Krsna says to Arjuna - "I am the father of this universe, the mother, the support and the grandsire. I am the object of knowledge, the purifier and the syllable Oḿ. The Bhagvad Gita (17.23) again recites: om tatsatiti nirdesho brahmanstrividhah samratah "OM, tat and sat have been declared as the triple appellation of Brahma, who is Truth, Consciousness and Bliss." The Yoga Sutras of Patanjali states in verse (1:27): "tasya vacakah pranavah" which translates as, "God's voice is Aum." In Puranic Hinduism, Aum is the mystic name for the Hindu Trimurti, and represents the union of the three gods, viz. a for Brahma, u for Vishnu and m for Mahadev which is another name of Shiva. The three sounds also symbolize the three Vedas (Rigveda, Samaveda, and Yajurveda). According to Hindu philosophy (specifically, Mandukya Upanishad), the letter A represents creation, when all existence issued forth from Brahma's golden nucleus; the letter U refers to Vishnu the God of the middle who preserves this world by balancing Brahma on a lotus above himself, and the letter M symbolizes the final part of the cycle of existence, when Vishnu falls asleep and Shiva has to breathe in so that all existing things have to disintegrate and are reduced to their essence to him. More broadly, Aum is said to be the primordial sound that was present at the creation of the universe. It is said to be the original sound that contains all other sounds, all words, all languages and all mantras. Vaishnava Dvaita philosophies teach that 'Aum' is an impersonal sound representation of Vishnu/Krishna while Hari Nama is the personal sound representation. A represents Krishna, U Srimati Radharani and M jivas. According to Sridhara Svami the pranava has five parts: A, U, M, the nasal bindu and the reverberation (nada). Liberated souls meditate on the Lord at the end of that reverberation. For both Hindus and Buddhists this syllable is sacred and so laden with spiritual energy that it should only be pronounced with complete concentration. In Advaita philosophy it is frequently used to represent three subsumed into one, a common theme in Hinduism. It implies that our current existence is mithyā and maya, "falsehood", that in order to know the full truth we must comprehend beyond the body and intellect the true nature of infinity. Essentially, upon moksha (mukti, samādhi) one is able not only to see or know existence for what it is, but to become it. When one gains true knowledge, there is no split between knower and known: one becomes knowledge/consciousness itself. In essence, Aum is the signifier of the ultimate truth that all is one. It is also believed that after a very long time of meditation the Purusha Sukta revealed the word AUM as being the truth. In Tamil "Om” literally means "Yes", or "Yes, it is". When Aum is a part of a place name (for example Omkareshwar), or is used as a man's name, it is spelled phonetically using ordinary letters of whatever Indian alphabet is used in the area. pIn Jainism, Aum is regarded as a condensed form of reference to the five parameshthisp, by their initials A+A+A+U+Mp(o3p>mp). The Dravyasamgrahp quotes a Prakritp line: "Aum" is one syllablep made from the initials of the five parameshthis. It has been said: "Arihanta, Ashiri, Acharya, Upadhyaya, and Muni“. . Thus, ओं नमः ṃ namaḥ) is a short form of the Navkar Mantra. The Buddhists place om at the beginning of their Vidya-Sadaksari or mystical formulary in six syllables (viz., om mani padme hum). As a seed syllable (bija mantra), it is also considered holy in Esoteric Buddhism. Om is one of the most commonly chanted sound symbols in India. It has a profound effect on the body and mind of the one who chants and also on the surroundings. Most mantras and Vedic prayers start with Om. All auspicious actions begin with Om. It is even used as a greeting - Om, Hari Om etc. It is repeated as a mantra or meditated upon. Its form is worshipped, contemplated upon or used as an auspicious sign. Om is the universal name of the Lord. It is made up of the letters A (phonetically as in “around”), U (phonetically as in “put”) and M (phonetically as in “mum”). The sound emerging from the vocal chords starts from the base of the throat as “A”. With the coming together of the lips, “U” is formed and when the lips are closed, all sounds end in “M”. The three letters symbolize the three states (waking, dream and deep sleep), the three deities (Brahma, Vishnu and Shiva), the three Vedas (Rig, Yajur and Sama) the three worlds (Bhuh, Bhuvah, Suvah) etc. The Lord is all these and beyond. The formless, attribute-less Lord (Brahman) is represented by the silence between two Om Chants. Om is also called pranava that means, “that (symbol or sound) by which the Lord is praised”. The entire essence of the Vedas is enshrined in the word Om. It is said that the Lord started creating the world after chanting Om. Hence its sound is considered to create an auspicious beginning for any task that we undertake. The Om chant should have the resounding sound of a bell (aaooommm). Thus, Om symbolizes everything - the means and the goal of life, the world and the Truth behind it, the material and the Sacred, all form and the Formless. The mystic syllable of Hinduism, placed at the beginning of most sacred writings. As a mantra, it is pronounced aw (as in law), "oo" (as in zoo), mm. Aum represents the Divine. For its initial sound "aa," vibrates within the muladhara, the chakra at the base of the spine upon which this God sits. The second sound of this mantra, "oo," vibrates within the throat and chest chakras. The third sound, "mm," vibrates within the cranial chakras, ajna and sahasrara, where the Supreme God reigns. The dot above, called anusvara, represents the Soundless Sound, Paranada. Aum is explained in the Upanishads as standing for the whole world and its parts, including past, present and future. It is from this primal vibration that all manifestation issues forth. Aum is the primary, or mula mantra, and often precedes other mantras. It may be safely used for chanting and japa by any person belonging to any religion. Its three letters represent the three worlds and the powers of creation, preservation and destruction. Pranava in Sanskrit means "humming. "The mantram Aum denotes God as the Primal Sound. This sound can be heard as the sound of one's own nervous system, and meditators and mystics hear it daily, like the sound made by an electrical transformer or a swarm of bees, ora thousand veenas playing in the distance. It is a strong, inner experience, one that yogis hold with great reverence. The meditator is taught to inwardly transform this sound into the inner light which lights up ones' thoughts, and to bask in this blissful consciousness of light. Pranava is also known as the sound of the nadanadi sakti. Hearing it one draws near to God Consciousness. When we are living in the lower chakras, or when the world too strongly dominates our mind, this sound may, for a time, not be heard. But it returns as awareness withdraws, as the mind becomes perfectly quiescent, silent, and still. Listen for this sound in your quietest moments and you will learn to recognize it as a daily encounter with the Divine that lives within all men, within all creatures, within all existence.